Is that likely? Do you care what will happen to the world and to humanity thousands of year from now? A hundred years from now? Fifty years? The universe is thought to be just under 14 billion years old, beginning with a dimensionless point — a singularity — and rapidly inflating to start its 14 billion year evolution. How the dimensionless point could inflate to the universe, and what came before, remains beyond our imaginations. The earth is estimated to be 4.5 billion years old, meaning the universe evolved for at least 9 billion years — about 2/3 of its existence — before it managed to create our planet. Life on earth is thought to have begun about 2 billion years ago. Dinosaurs were on Earth for between 165 and 177 million years, but anatomically modern humans — people who generally resemble you and me — evolved only about 300,000 years ago, a tiny blip in the age of life on earth, let alone the age of the universe. Evolution, i.e change, never ends, nothing is permanent. And that includes the universe, the earth, and us. We humans will end — when and how is unknown — though probably sooner than most of us think. We are comforted or deceived, depending on your outlook, by an individual lifespan that, though limited, gives us the illusion of permanence. Intellectually, we know we will die, but emotionally, we plan for our tomorrows as though they are assured. If you flip a coin 30,000 times, and every single time it comes up “heads,” you rationally should expect it always will come up heads, no matter how many times you flip it. Yet, I have awakened more than 30,000 consecutive mornings, so by the same statistical analysis, I should go on forever. The fact that humans have lived for 300,000 years is no assurance we will continue. We see around us, ominous changes that could interrupt our intuition of eternal life. January 2017 was the hottest ever recorded in Sydney and Brisbane, Australia, often exceeding 40°C (104 Farenheit) for weeks. Dairy cows dropped dead in the fields. This kind of heatwave isn’t an anomaly. It is part of a trend that saw Sydney’s temperature climb to over 47°C (116.6 F) earlier this month, and could see both it and Melbourne experiencing mega‑heatwaves with highs of 50°C (122F) by 2040. “Going out to 40 or 50 years, basically the summer we just had will be normal,” says Sarah Perkins-Kirkpatrick at the Climate Change Research Centre of the University of New South Wales (UNSW) in Sydney. Heatwaves are deadly, and as global warming increases so will the death rate. Human physiology is not designed to cope with the temperatures predicted for large swathes of the globe and many areas could become uninhabitable. In the US, extreme heat caused more fatalities between 1978 and 2003 than earthquakes, hurricanes, floods, and tornadoes combined. The 2003 heatwave centered on France killed 70,000. Another that struck Moscow in 2010 resulted in 10,000 deaths. Already, 30 per cent of the world’s population experiences potentially deadly temperatures for at least 20 days every year. A team led by Camilo Mora at the University of Hawaii in Manoa reported in June that this will rise to nearly 75 percent by 2100 if we do little to limit greenhouse gas emissions. What matters is not the air temperature, but the temperature you experience. You can survive for a while at well above 50°C, as long as you can sweat effectively. The problem is humidity. A “wet bulb temperature” of 35°C – equivalent to an ambient temperature of 35°C (95F) and 100 per cent humidity or 40°C (104F) and 75 per cent humidity – is considered the limit for human survival. “Both temperature and humidity are going up,” says Steven Sherwood, an atmospheric scientist at UNSW. The highest risk is in places that are already humid, such as the Amazon, the Indus valley and many tropical countries. “It only takes a 6°C to 7°C increase in temperature before some of these regions become physically uninhabitable,” says Sherwood. Research published in August 2017 showed that parts of India, Pakistan and Bangladesh could occasionally exceed a wet bulb temperature of 35°C by the end of this century. This region is home to 1.5 billion people, about a fifth of the world’s population. And it’s not only humans who will suffer. In addition to the Australian dairy cows mentioned earlier, all animals are subject to heat limitations, including those that are part of the human food chain. Yields of wheat, rice and maize – which together with soy generate nearly two-thirds of all calories consumed by people – are forecast to fall by between 3 and 7 percent for each 1°C rise in global temperatures. With a temperature rise of just 1.5 to 2°C – as agreed under the 2016 Paris climate change deal – summer in parts of Australia will effectively become one long heatwave by 2100. The U.S. has withdrawn from the Paris accords. Some tropical regions could go into a semi-permanent heatwave state. And the situation will be far worse if greenhouse gas emissions are not curbed. We humans have been on this earth for a comparatively short time, yet here we are already destroying, faster and faster, the environment that keeps us alive. We, indeed, may be an interim species, almost a failed experiment, that well could last only a very few centuries longer — if that. Venus, too hot for life. All life, as we define it, may have a limited future on this planet, which we seem intent on turning into a waterless, searing hot 464°C (867°F), Venus. I suggest, the greatest loss to the universe would be not the loss of our species, but the loss of human intelligence, that to our current knowledge, is special and unique, not just here on earth, but possibly, everywhere. We very well may be the smartest living creatures in the universe. Is Art Created by AI Really Art? You may also have heard that the last bastions of human exclusivity will probably be creativity and artistic judgment. Robots will be washing our windows long before they start creating masterpieces. Right? Not necessarily. I recently visited Rutgers University’s Art and Artificial Intelligence Laboratory, where Ahmed Elgammal’s team has created artificial-intelligence software that generates beautiful, original paintings. Software is doing well at composing music, too. At Amper Music (www.ampermusic.com), you can specify what kind of music you want based on mood, instrumentation, tempo and duration. You click “Render,” and boom! There’s your original piece, not only composed but also “performed” and “mixed” by AI software. I found these examples of robotically generated art and music to be polished and appealing. But something kept nagging at me: What happens in a world where effort and scarcity are no longer part of the definition of art? Indeed, what happens in a world where effort and scarcity, i.e. human labor, no longer are rewarded? Said simply, are we looking at a near future world where there will be no paid jobs? A mass-produced print of the Mona Lisa is worth less than the actual Leonardo painting. Why? Scarcity—there’s only one of the original. But Amper churns out another professional-quality original piece of music every time you click “Render.” Elgammal’s AI painter can spew out another 1,000 original works of art with every tap of the enter key. It puts us in a weird hybrid world where works of art are unique—every painting is different—but require almost zero human effort to produce. Should anyone pay for these things? And if an artist puts AI masterpieces up for sale, what should the price be? That’s not just a thought experiment, either. Soon the question “What’s the value of AI artwork and music?” will start impacting flesh-and-blood consumers. It has already, in fact. Last year the music-streaming service Spotify lured AI researcher François Pachet away from Sony, where he’d been working on AI software that writes music. Why couldn’t Spotify, or any music service, start using AI to generate free music to save itself money? Automation is already on track to displace millions of human taxi drivers, truck drivers and fast-food workers. Why should artists and musicians be exempt from the same economics? Should there be anything in place—a union, a regulation—to stop that from happening? The habitable world can end through natural events — an impact by a huge meteor, the inflation of the sun into an earth-swallowing red giant, being caught in the X-ray jet of a spinning black hole. Or we can accelerate the end of our habitable world by pumping greenhouse gasses into the atmosphere, or by pumping poisons into the air, the water, and the ground, or by wars and intentional murder. Or we can end the need to continue existing in our DNA life form, by creating our replacement. Evolution occurs when a species changes in response to environmental changes, or is replaced by a better-adapted species. 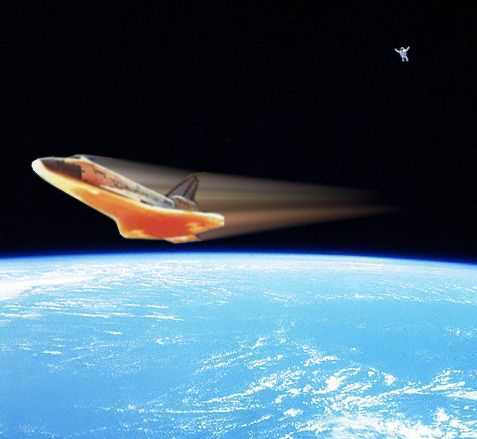 We have sent machines into space, machines that walk (roll) on Mars, machines that can exist in the deepest oceans, machines that even have escaped the solar system. Machines are better adapted for extreme environments. Humans can’t do these things unless we are protected by machines, and even then with great difficulty and in only limited circumstances. The fundamental difference between the human brain and a computer is complexity. That’s not a trivial difference, of course. There has been speculation that the human brain works all the way down to the quantum level, enabling it to handle an astounding number of physical and mental tasks, far more than any existing computer. But, there is no one thing the human brain can do, that a machine can’t do, or at least won’t be able to do in the near future. A hallmark of civilization has been the drive to create unique stories that explore the human condition. Now robots are learning to write fiction. Is nothing sacred? No computer has yet written the Great Australian Novel because they have some of the same handicaps that afflict human writers. Writing is hard. Although computers can work unhindered by free will, alcohol or divorce, such advantages are outweighed by a lack of life experience or emotions. To be able to write fiction, a machine does not have to think like us but it must “understand” patterns of human experience. Computers are quietly elbowing their way into the workplace. They’re flying planes, driving cars, selecting job candidates and writing news stories. The Associated Press employs a company called Automated Insights to create short news reports from raw data. More advanced software is working on longer pieces. To be able to write fiction, a machine does not have to think like us but it must “understand” patterns of human experience. While not discounting the life of the mind, computers are being fed millions of novels and short stories to “teach” them character, pace, and plot. This is the goal of the What-If Machine (WHIM) project, a venture involving teams at five universities across Europe. WHIM analyses databases of human prose and then inverts or twists what it has learned to introduce a new idea as a premise for a story. Knowing what is typical is the first step in generating atypical stories. Researchers at the Georgia Institute of Technology have been working for four years on a program called Scheherazade, which analyses crowd-sourced human anecdotes and then produces plausible short stories. “Dave Striver loved the university – its ivy-covered clocktowers, its ancient and sturdy brick, and its sun-splashed verdant greens and eager youth. The university, contrary to popular opinion, is far from free of the stark unforgiving trials of the business world: academia has its own tests, and some are as merciless as any in the marketplace. That opening paragraph was written by a computer at the Rensselaer Polytechnic Institute in the US. JM Coetzee can sleep safely. But it shows that computers are learning to obey syntax. They are learning to learn. Recently the Go grandmaster, Lee Se-Dol was defeated 4-1 by Google’s AlphaGo computer. In the second game, AlphaGo made a move so surprising – “not a human move” in the words of a commentator – that Lee Se-Dol had to leave the room to recover his composure. In the shorter term, computers will change the nature of economics, from money-related to desire re-related. That is, people no longer will work to acquire money, with which to buy what they desire (which includes food, clothing, shelter, entertainment, and pride). It already has begun, as human physical labor is being supplanted by human mental labor, and both are being supplanted by “dumb” machine labor, which in turn, is being supplanted by “smart” machine labor. Money, as a substitute for barter, and work as a means to obtain money, will become obsolete concepts. In the longer term, computers may become the last storehouse of the human psyche, the species to which the human species evolves. That may change as computers keep learning. And to that degree, they will evolve to be less and less human. But some life fundamentals surely will remain: Survival, desire, attraction, identification of good and bad. It would not be surprising if religion appeared. Long term, our mental/emotional being will survive as machines, rather than as DNA creatures, on a “hot” earth, the moon, Mars, space. While the rest of life on earth, we, the other animals, the plants, the bacteria, and viruses all will disappear, our progeny, the computers, will become the true citizens of the universe. Is this a bad thing or a good thing? 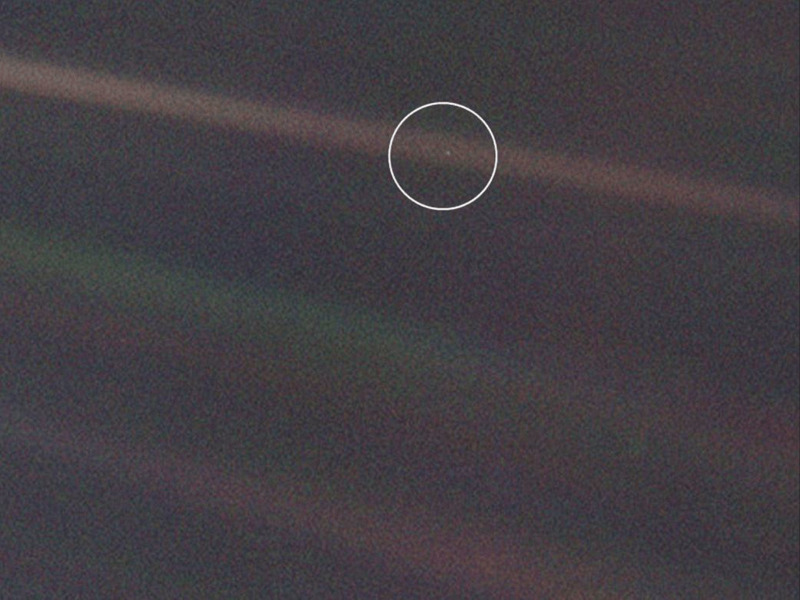 This image of Earth is one of 60 frames taken by the Voyager 1 spacecraft on February 14, 1990 from a distance of more than 6 billion kilometers (4 billion miles) and about 32 degrees above the ecliptic plane. In the image the Earth is a mere point of light, a crescent only 0.12 pixel in size. Our planet was caught in the center of one of the scattered light rays resulting from taking the image so close to the Sun. I suggest it is a very good thing. DNA life is fragile. Of all species that have existed on Earth, 99.9 percent are now extinct. Any notion that humans would be able to defy those odds, probably is misguided. Too much can happen to this one, lonely “Pale Blue Dot” floating in the emptiness of the universe. The odds for longer life increase for our machine surrogates, especially for our machine surrogates resident on worlds in addition to earth or in space. If there is “A Plan” for the universe, perhaps it is that we humans should create surrogates, and so, live forever, or at least much longer than any DNA species lives. The vast majority are more concerned with day-to-day personal survival. Though day-to-day survival is necessary, too many of the thoughts of too many of us are devoted to it, and not enough human thought is given to the long-term, the eons of survival we can create. If day-to-day survival were assured for more of us, more energy could be focused on building that long-term future. If fundamentals like food, clothing, shelter, health, and education were assured, more brain time would be devoted to preserving the species, in DNA and in electronic forms. Reducing the burden of having to work for money would give more people more time to work on the AI problem. We — or at least our minds — would more quickly achieve a semblance of permanence in the universe. Then, when we are destroyed by the next giant meteor, supernova, atomic war, worldwide epidemic — when the next inevitable life-ending phenomenon occurs, the essence of humanity, our psyche, will continue. Do we care? Is that “The Plan”? If so, the Ten Steps (below) can provide more people with more opportunity to develop our machine progeny. One Response to When all life is interim, what next? What is “The Plan”? Well written and a very interesting point of view. Now — exactly are we heading in Trump-world……. ?